I am just going to present the remainder of my photos from the Symposium for your viewing pleasure. Most of these were taken in the Past Presenters exhibition, with a few final-day studio photos. 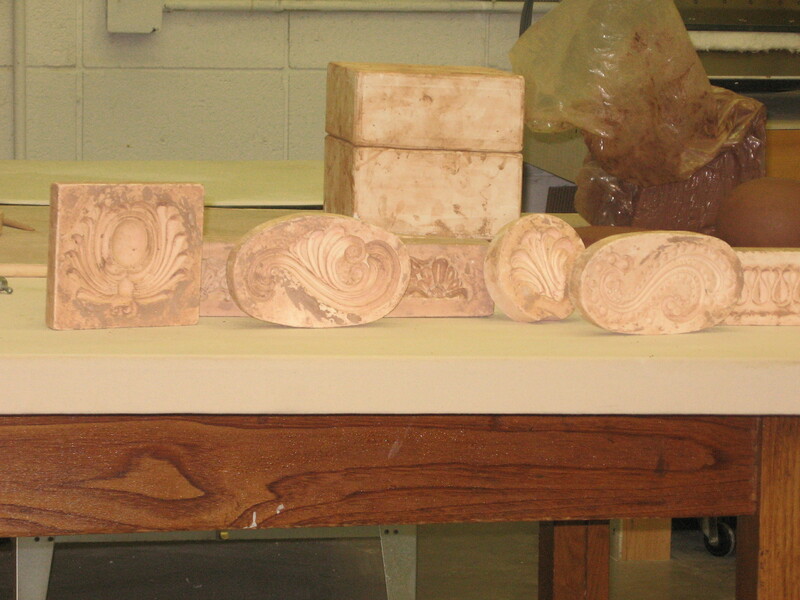 Next on the agenda I’ll post about my experience at the Forrest Lesch-Middelton demo in Plano, TX last weekend. But for now, please enjoy the following photos! 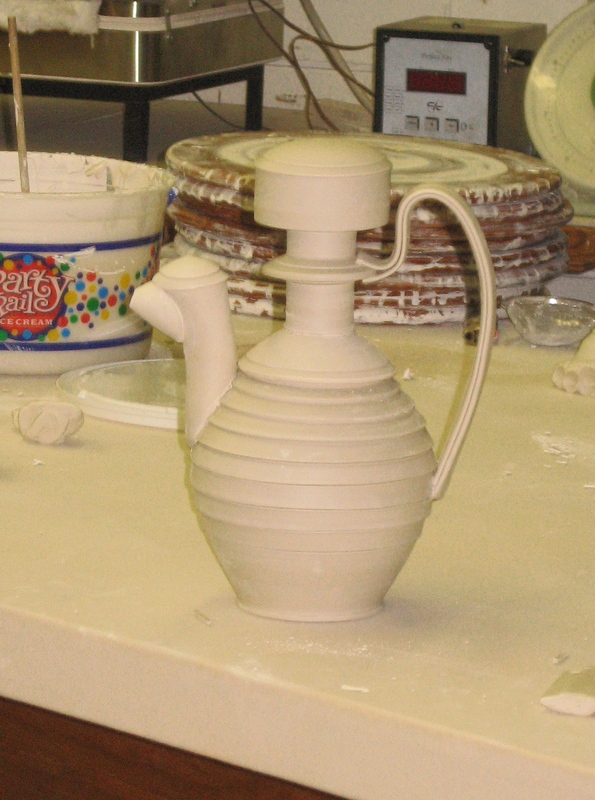 A teapot by Mark Shapiro and an Aysha Peltz jar. I am the proud owner of this jar, which I don’t expect in the mail until mid-November. A place setting by William Broullard. I found the design of this set particularly beautiful. 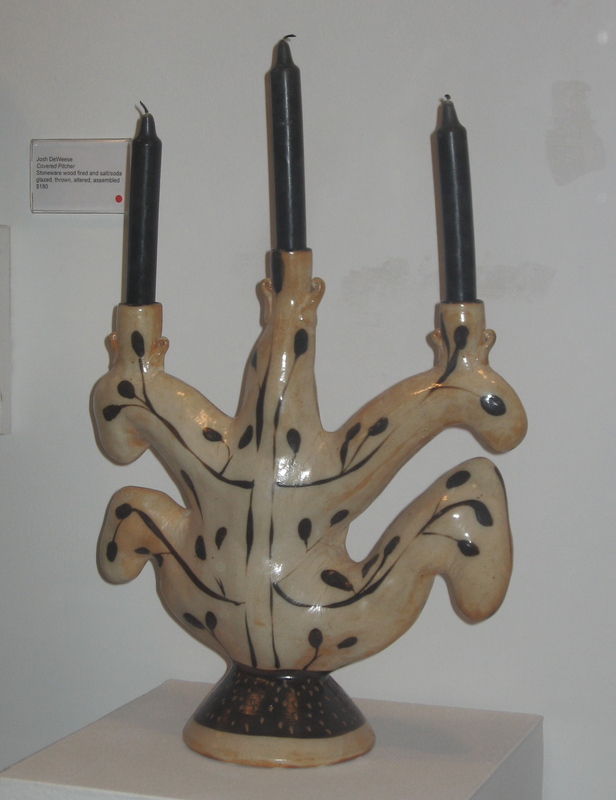 Check out this gorgeous Suze Lindsey candelabra. 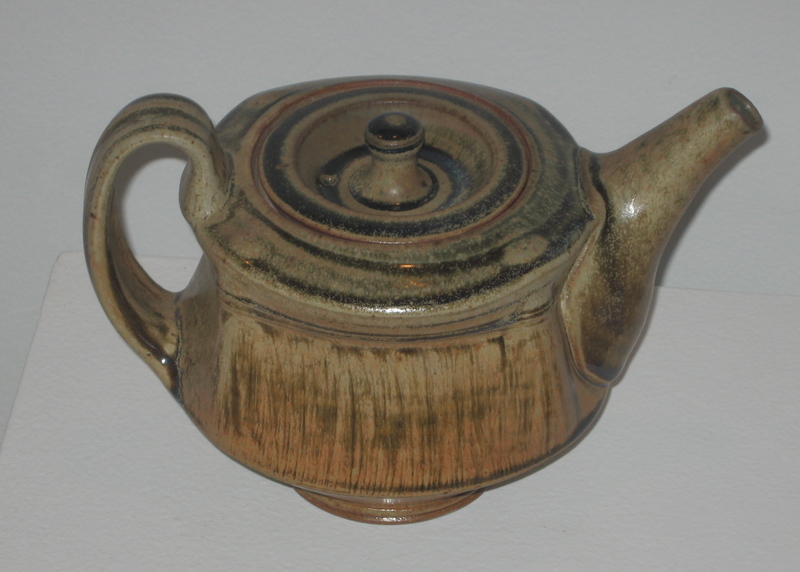 Free-form pots come so easily to Nick Joerling, or so it seems. 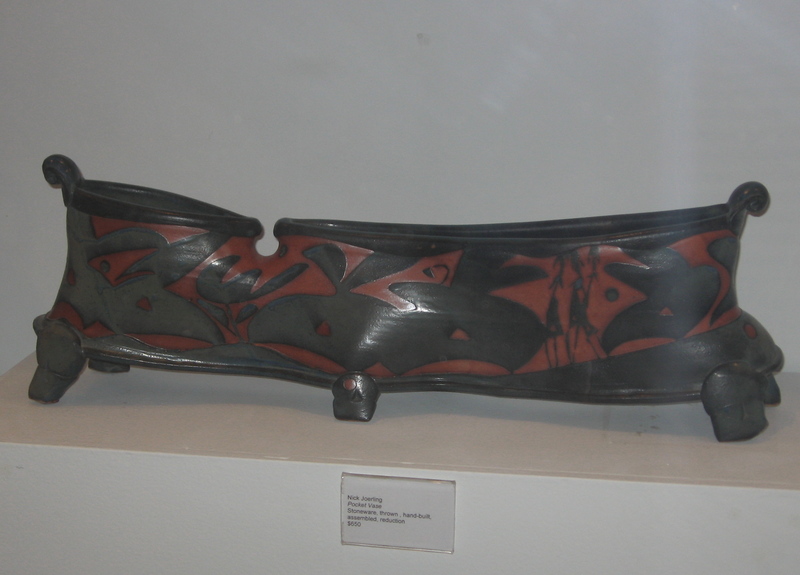 This incredible ceramic object was easily 2-3′ in length. 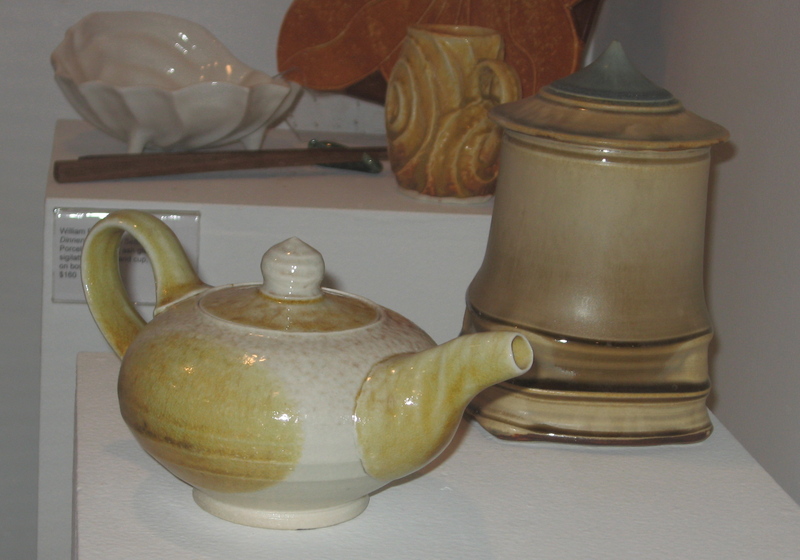 Two pitchers with totally unique surface treatments. 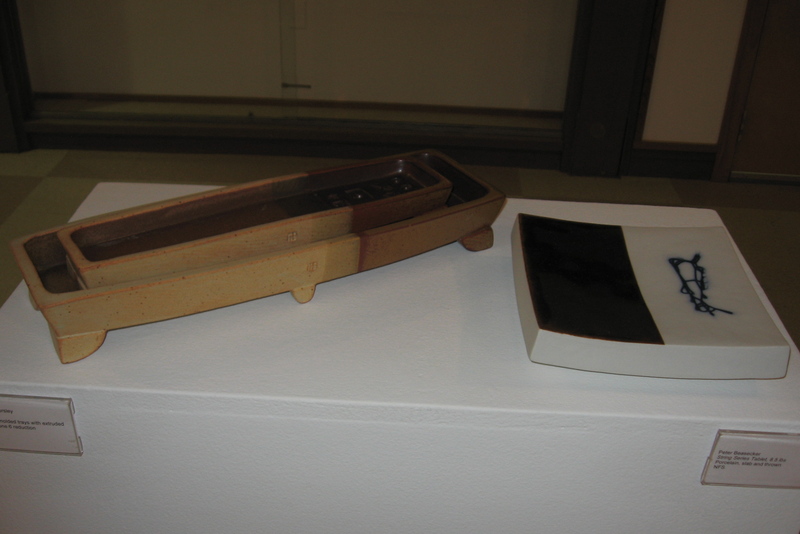 Cynthia Bringle (if memory serves) incised her buff surface while Sarah Jaeger employed color and pattern. 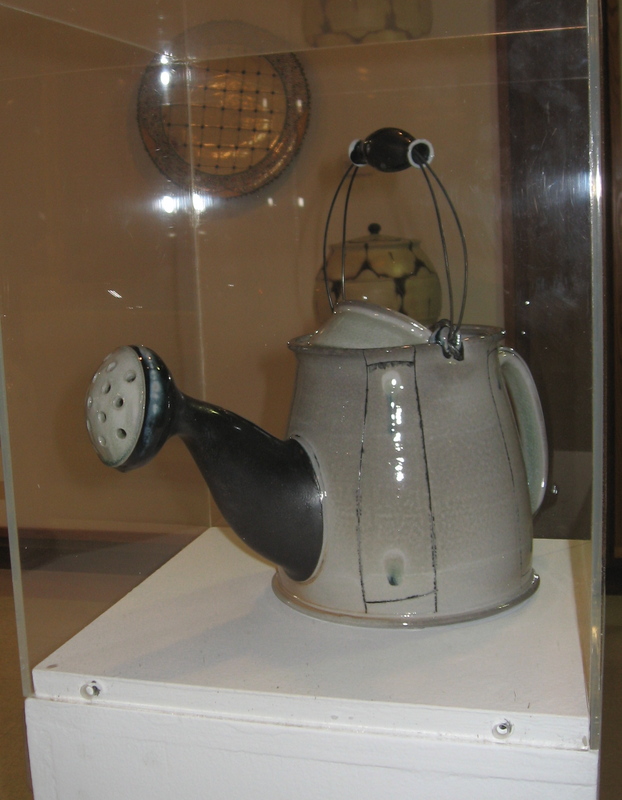 One of Ellen Shankin’s glorious teapots. 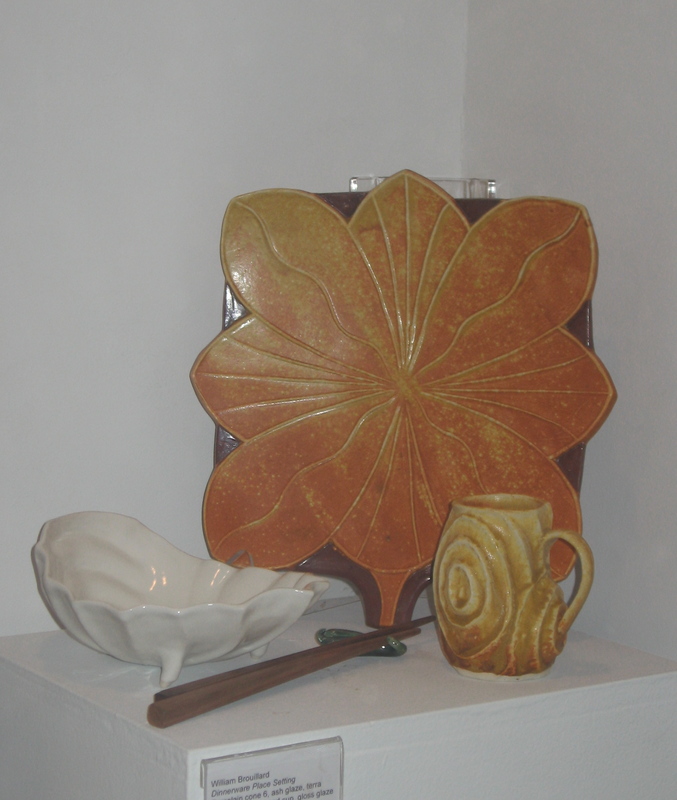 Another acquisition for my budding collection, a Diane Rosenmiller berry bowl. 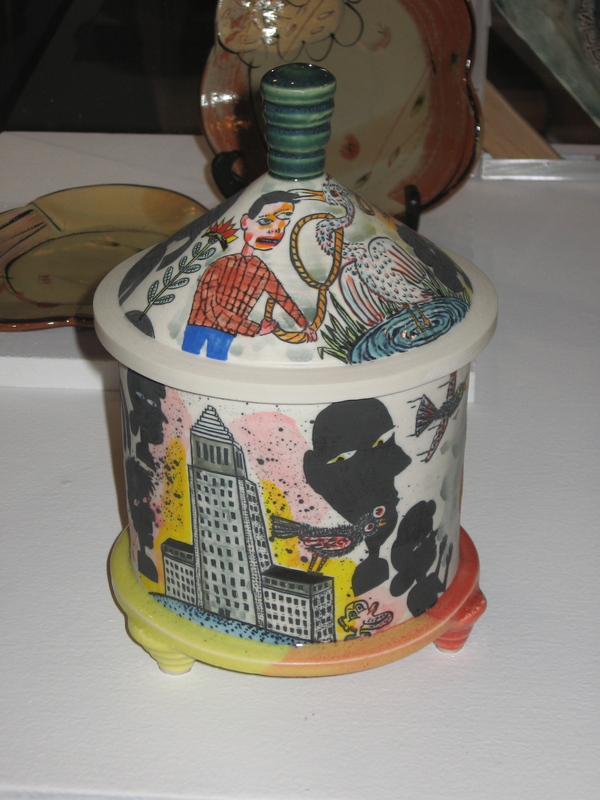 An elaborate, highly decorated jar by Michael Corney. 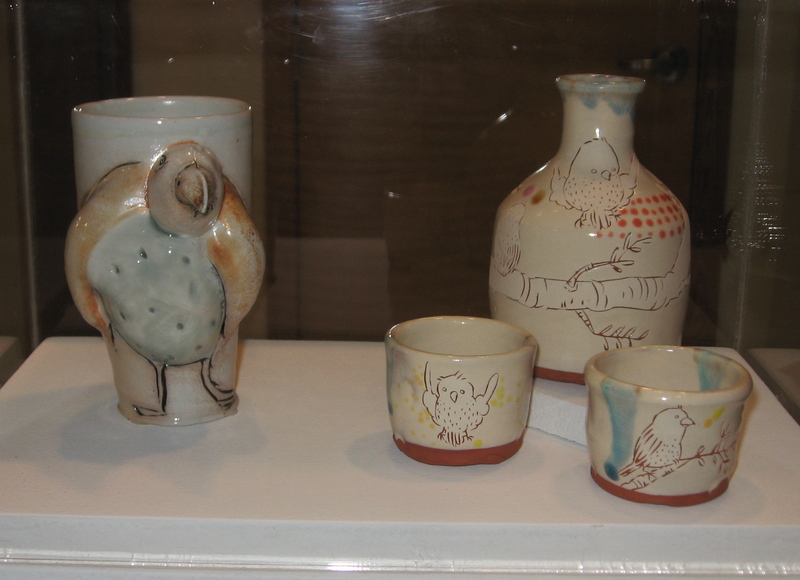 Atmospheric fired Bernadette Curran cup with a sake set by Ayumi Horie, incised through white slip to create drawings. The Peter Beasecker heavy slab plate comes from a line of work called “string series.” I studied under Peter in college at SMU. 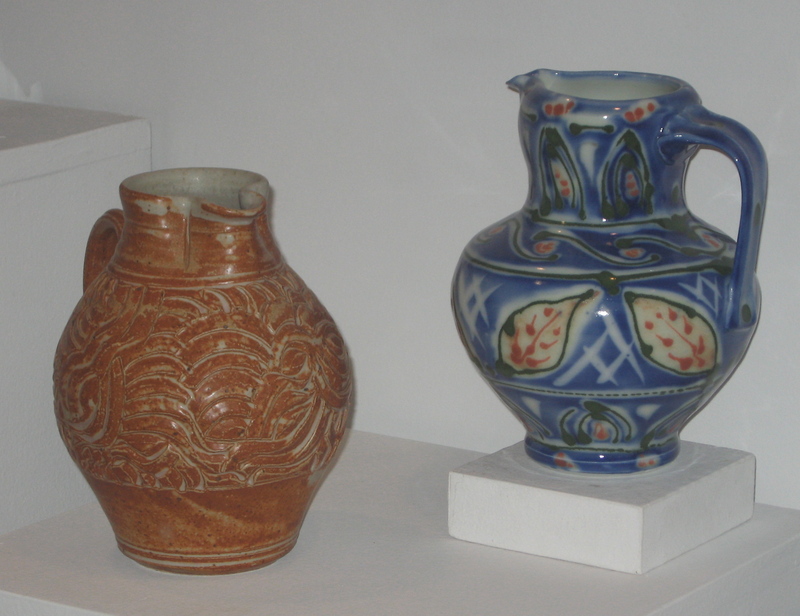 I definitely like the adjacent nested vessels, but I can’t recall the artist and my margin cut off the label. 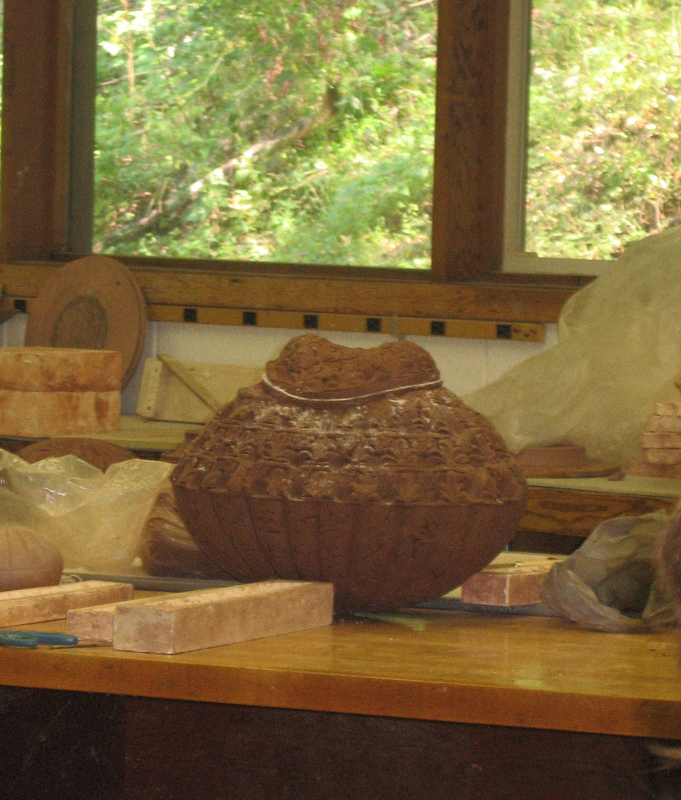 Lorna Meaden watering pot with a large Linda Sikora jar in the background. 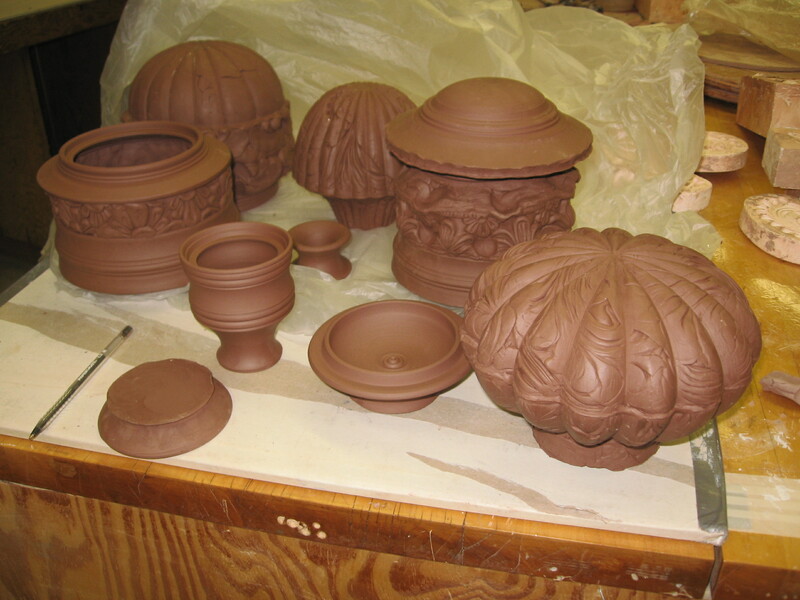 A. Blair Clemo plaster molds for pressing sprigs from which to handbuild vessels. 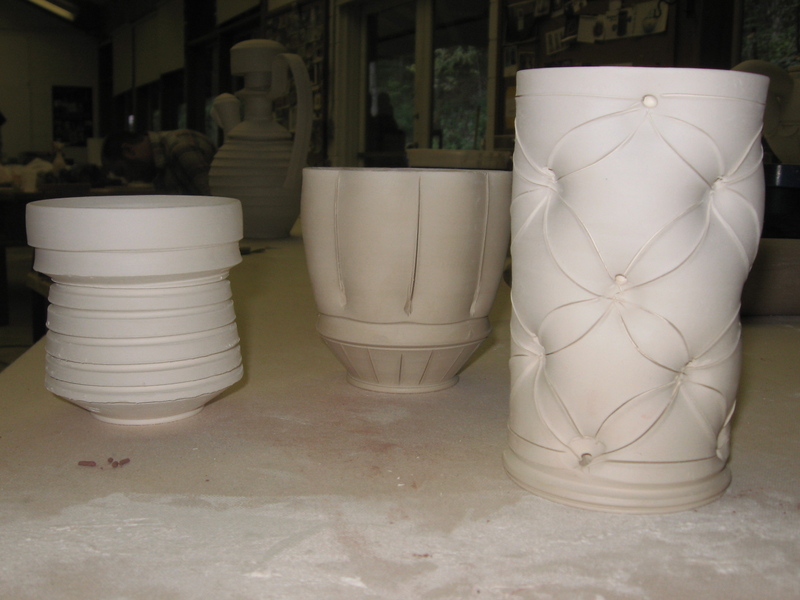 Some leather hard partial and complete demo pots on Blair Clemo’s table. 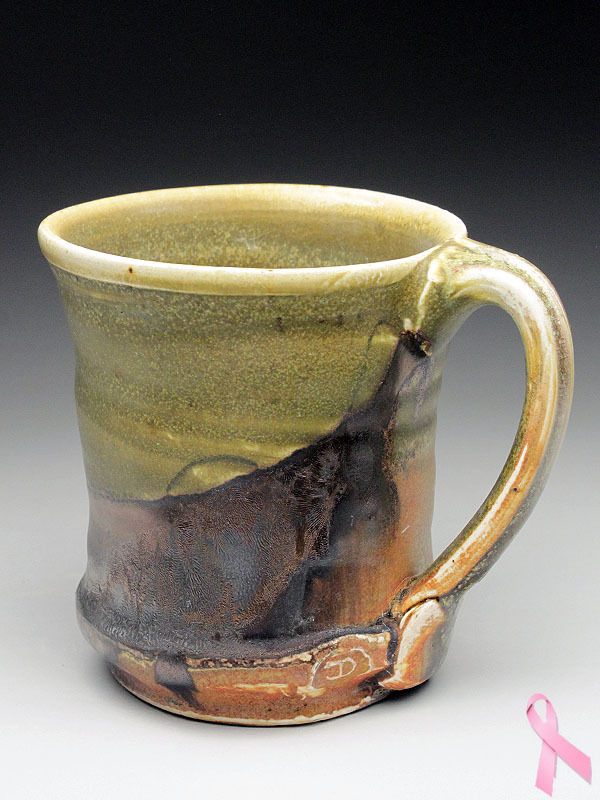 Leather hard Shawn Spangler pouring pot. Greenware assortment of cups by Shawn Spangler. 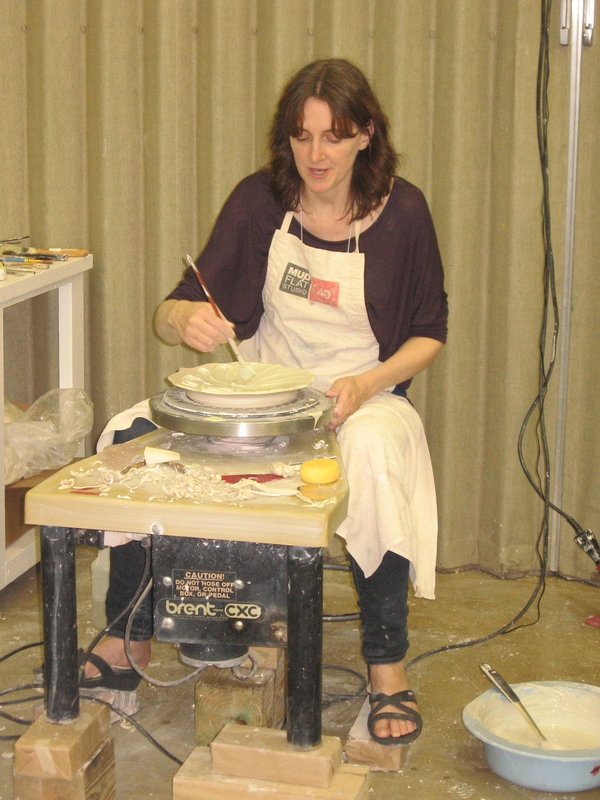 Monica Ripley, about to demo her method of slip manipulation for her cut-rim plates. 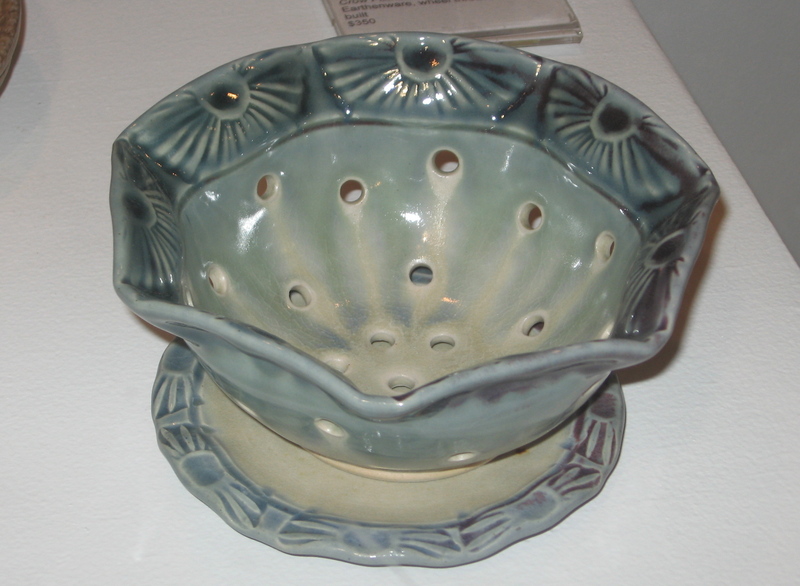 A tureen body form by Blair Clemo, probably sprinkled with corn starch to inhibit sticking between lid and flange. At the Saturday night party, my good friend and fellow SMU alum Brooks and I had to get a photo to commemorate the occasion. 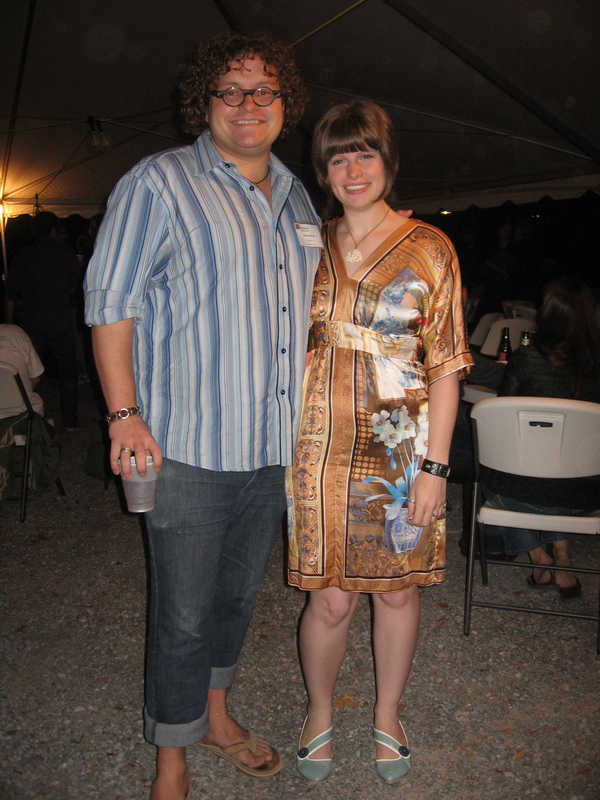 I found this silk dress at Buffalo Exchange, and as soon as I saw the blue and white Chinese pottery print I knew it would look perfect for the event. I had a fabulous time at the Symposium, and my studio work is still reeling from a fresh and much more ambitious approach.